We are very happy to launch another book of the Alchemy of Love Mindfulness Training Serias. Mindful Eating with Delicious Raw Vegan Recipes book is designed with the best Alchemy of Love Mindful Eating Exercises and a collection of Delicious Raw Vegan Recipes that aim to inspire you to eat mindfully fresh, uncooked fruits and veggies every day. Our experienced vegan chef Olivera Rosic adores experimenting and creating the most appetizing vegetarian dishes, delicious freshly squeezed juices and rich chocolate creams with raw coco. Her mind is always full of little cooking secrets of how to create a dish that is truly unique. Olivera is passionate about good tasting food. She manages to convince anybody who tries her recipes that raw is by no means boring and that it can be amazingly tasty. Olivera engineered a wonderful concept of connoisseur of raw food. She is a joyful host of numerous retreats and raw food for health workshops. 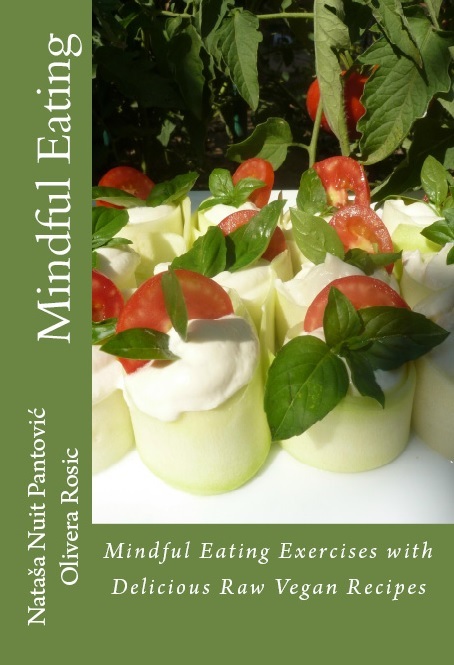 How did you get an idea to write the book Mindful Eating with Raw Recipes? My dear friend Natasa was developing Alchemy of Love Mindfulness Training and my work with raw vegan recipes and my efforts to spread the awareness and knowledge of healthy vegetarian nutrition fit beautifully with the vision of the publisher of the courses: Artof4Elements. I am first of all an ethical vegetarian. What is a Real Food for Health? Artof4Elements is a Mindfulness Training and self-help Publisher that designed and launched a mindfulness training serial called Alchemy of Love Mindfulness Training. Artof4Elements publishes books, audio, and video materials in areas of Mindfulness, Meditation, Self-Help, New Thought, Alternative Health, Vegetarian and Vegan Food and Nutrition, and Conscious Parenting.